The son of Andris and Daiga (a piano teacher), Smedins was born and currently resides in Kuldiga. 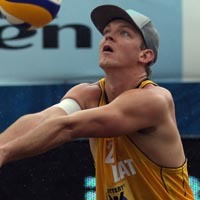 His younger brother Toms also competes on the international beach volleyball circuit. Most memorable Beach Volleyball moment? - Winning the 2005 European U-20 championship with his brother.